The community picnic held at Sondreson Meadows last Tuesday was a great success. It was a nice day, good food, and fun playing beanbag toss and horseshoes. Thank you to Jan and Alice Caldwell for their hard work. 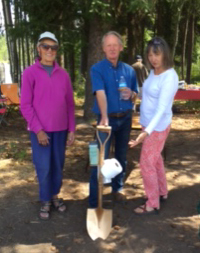 Special kudos to Jan for providing a much needed sanitation facility at Sonderson Meadow as pictured here.